1. Fabric Supplies: Suede, cotton fabric, interfacing (I purchased one yard in each, though I could have purchased half of a yard and been just fine), and suede cord. 2. Begin by cutting a 1x2 1/2 ft of suede and cotton fabric. 3. Take the cotton section and apply interfacing to the back side. 4. Next, glue the back of the suede to the back of the cotton fabric (the side with the interfacing) together with fabric glue. 5. Once it's dry, begin cutting small slits with the exacto knife, roughly one inch apart. If you have a cropadile it will make the whole project a bit easier to create, but I used an exacto knife and it worked just fine! Cut these slits around the entire perimeter of the fabrics. 6. 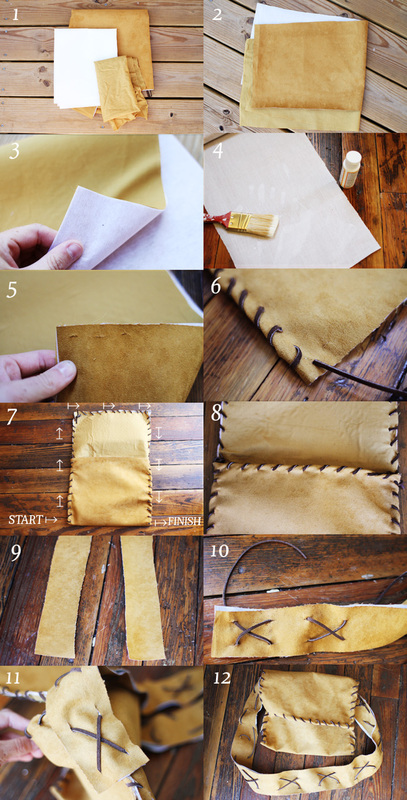 Then, begin threading the suede cord through the slits, forming it into a bag. 7. This is what it will look like once you've threaded it together. To thread it with one continuous piece of cord, fold the fabric so that it forms the pouch of the bag. Then, start threading the sides together at one end and make your way all along the edge until you reach the other side of the pouch. 8. Next, thread the top of the slit. 9. Once the base of the bag is complete, cut out two long strips for the strap. The length of this determines the length of the bag. 10. Glue these two pieces together, and begin threading it with the cord into large X's. 11. After the strap is complete, undo the thread of the last two X's. To attach it to the bag, simply cut slits into the bag on the exact spots where the X on the strap is. Then, re-thread the X while threading it through the bag as well. Repeat this on the opposite side. 12. All finished. What a great DIY! I totally want to try this out. love this! so easy and stylish! you are so creative my dear. those photos were taken on your roof?! you lucky girl! :) a roof to dream and write and take photos on sounds heavenly! Omg I love this, I would like to recreatate it let's see if comes out this good. Wonderful! Love it very much :D thanks for sharing! So cool! I love it! This looks great! I love it. Whoa that is super cool and surprisingly easy to do! Thank yoU! My sister brought me some great pieces of suede the other day and I think I'll try to make something similar out of it. Love this purse! LOVE this bag! I'm definitely going to make this one myself. Thanks for the post! Love love this!! :) I will be making this ASAP!